Gift registries are a wonderful way to celebrate your wedding or special occasion. I truly enjoy making pottery that is meant just for you – and knowing it will be a part of your daily lives and joyous celebrations for decades to come. Many couples have registered with Tiffany Hilton Pottery for their dinnerware, as well as some others who chose to mark their 50th or 75th birthdays with the hand made dinnerware set they had always wanted. Whether it’s your morning oatmeal or your 25th anniversary dinner, hand crafted pottery will be sure to add a little something special to your lives. Though each piece of dinnerware is custom made, I have standard size plates, bowls, and mugs which can be ordered in a variety of glazes or combinations of colors. One-of-a-kind serving pieces are also a nice addition to your registry and offer different gift options to your friends and family. Sugar and creamer sets, large bowls, oven safe casseroles, vases, platters and serving trays are popular choices. Custom pieces may be created such as cups and saucers, espresso cups, utensil holders, canisters and pitchers. 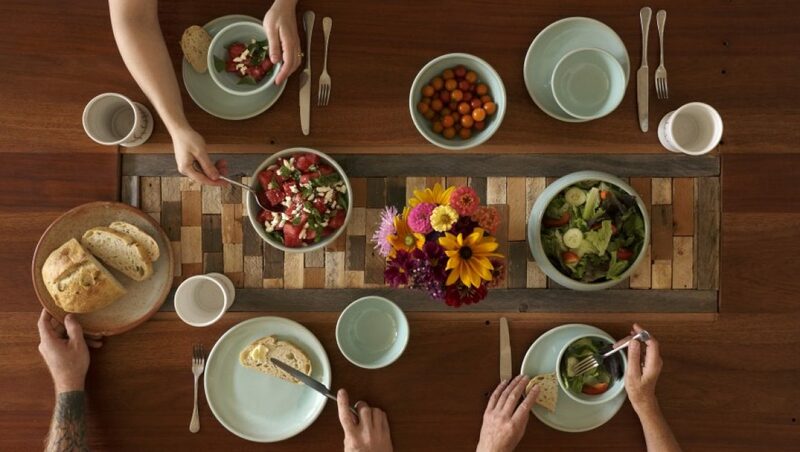 A full place setting with a dinner plate, lunch plate, and bowl is about $110. You can adjust your registry to include any combination of pieces. Whether you are looking for 12 full place settings or a set of 4 plates and mugs – I am happy to design a registry specifically for you. Images will be made available for you to use on a web site or may be listed on my own site to show your guests the pottery you are interested in. People wishing to purchase pottery for you may contact me by phone or email. Checks, Visa, Mastercard, and Discover cards are accepted. Custom dinnerware orders may take several months to create. My ability to fill orders depends on the time of year and how many orders are ahead of yours. I can usually fill orders within 12 weeks – but please contact me to discuss your needs and I will try to accommodate you!